This Valentine’s Day give a loved one the gift of a perfect night’s sleep with Nanu’s personalised pillow. Nanu are a team of sleep specialists that give you the opportunity to create your own personalised pillow, helping to create your own perfect sleep experience. Creating your own personalised pillow is very easy to do. You simply answer 5 questions on the Nanu website and then Nanu can create your perfect pillow. The questions include entering your name, selecting the pillow firmness you like, selecting how you usually sleep, your height and your weight. Once all this information is entered you simply place your order and a pillow will be delivered to you in 3-5 working days. Nanu also offer a 30 day free trial so if you have created your pillow but it is not right, you may return it for a full refund. I have created my own personalised pillow on the Nanu website and I absolutely love it! 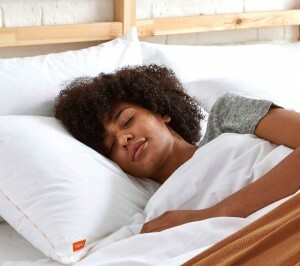 The pillow is much more comfortable than the previous pillow I was using and I have had great sleep since using it. The website is also very easy to use which is another great feature. The Nanu pillow is a great gift for Valentine’s Day as you will be giving a loved one the gift of the perfect sleep experience. Nanu are offering a special Valentine’s Day deal of buy one get one free so you can purchase 2 pillows for £35.00.